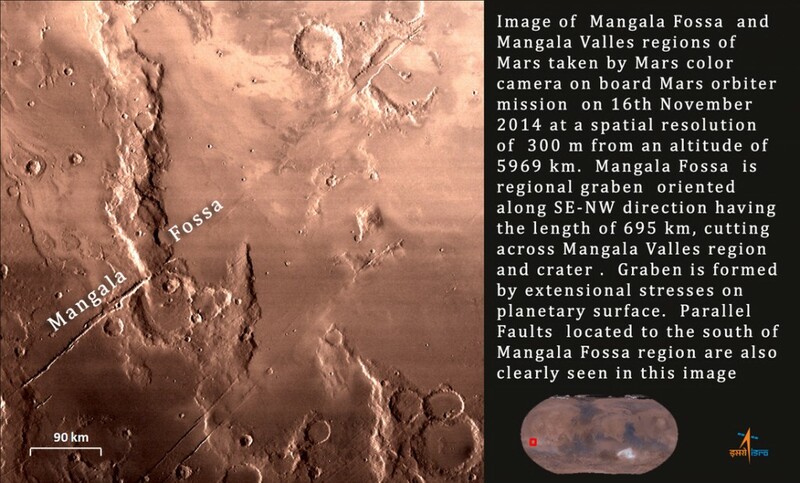 The Indian Mars Orbiter Mission has released a series of new images acquired by the MOM spacecraft that is currently in its extended mission following the completion of all its mission objectives during a 160-day primary mission in Martian orbit after its arrival in September 2014. MOM is currently preparing for a period of fully autonomous operations for several weeks due to the upcoming solar conjunction that will prevent reliable communications between Earth and Mars. Entering its extended mission phase, the Mars Orbiter will be operated for as long as possible to provide mission operators and engineers the maximum amount of data to assess the performance of all spacecraft systems given the nature of the MOM mission that first and foremost set out to demonstrate the technical aspects of interplanetary missions. As a bonus, the five instruments installed on the spacecraft are delivering science data and photos to contribute to the study of planet Mars. With Mars close to conjunction, the mission team will be commanding the MOM spacecraft into an extended period of autonomous operations during which only the core spacecraft systems are being operated by the spacecraft computer to avoid the craft running into an onboard fault or entering safe mode. 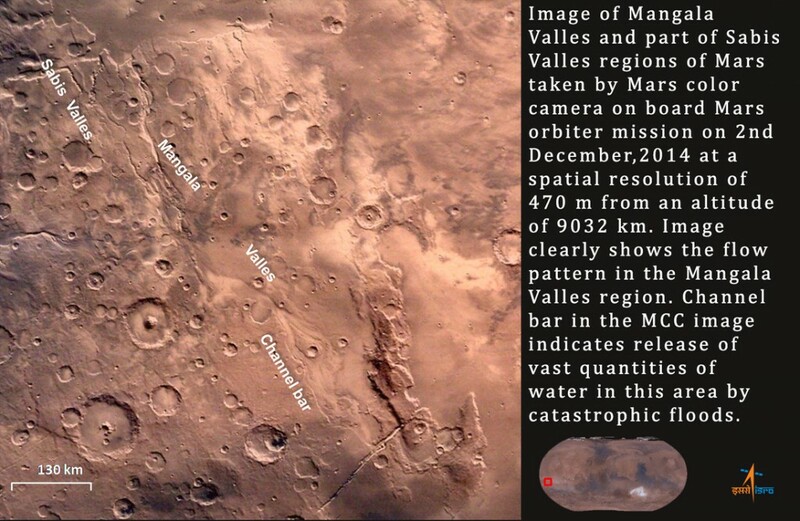 Conjunction occurs when Mars and Earth are in an opposite position in their respective orbits with the sun in between. Radio commands can be impaired or altered by plasma in the Sun’s atmosphere. That is why communications from Earth to Mars are ceased and communications from Mars to Earth are reduced to a minimum. Conjunctions occur every 26 months as Earth and Mars circle the Sun in their respective orbits. Every conjunction is different depending on orbital geometry and solar activity. Basic spacecraft tasks will be handled autonomously by MOM’s systems such as pointing the solar arrays toward the sun for optimized power generation, performing regular desaturations of the reaction wheels by using its thruster system, and listening for signals from Earth once conjunction ends. The mission team identified this time around conjunction as one of the most trying periods of the flight since MOM will be all on its own and can not phone Earth for help in case of trouble. The hope is that everything remains stable onboard the craft and that MOM continues to operate in a propellant-efficient way since propellant is the only consumable limiting the spacecraft’s operational life. 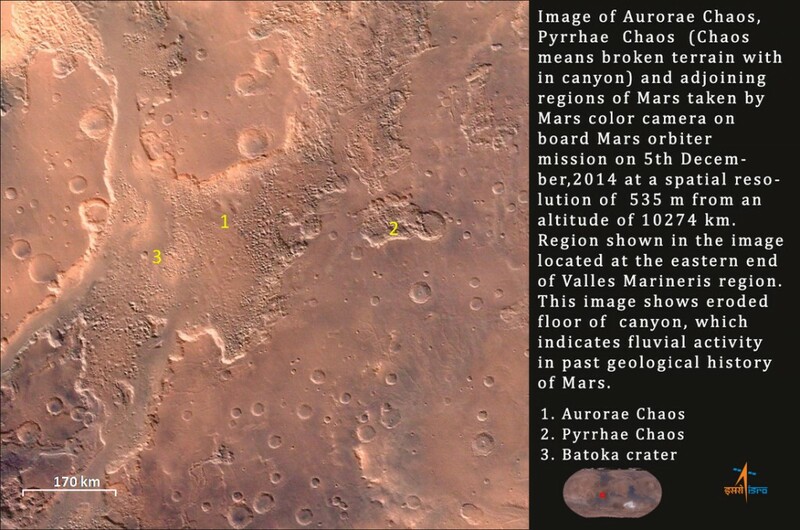 The photo to the top left of this article shows Tyrrhenus Mons in the Hesperia Planum region, taken on February 25 when MOM was at an altitude of 3,192 Kilometers creating an image resolution of 166 meters. 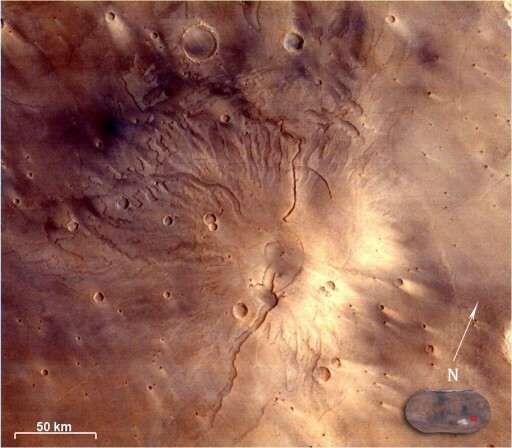 The image showcases flow features and fractures in a northeast to southwest direction and wind streaks behind protruding peaks are clearly visible. 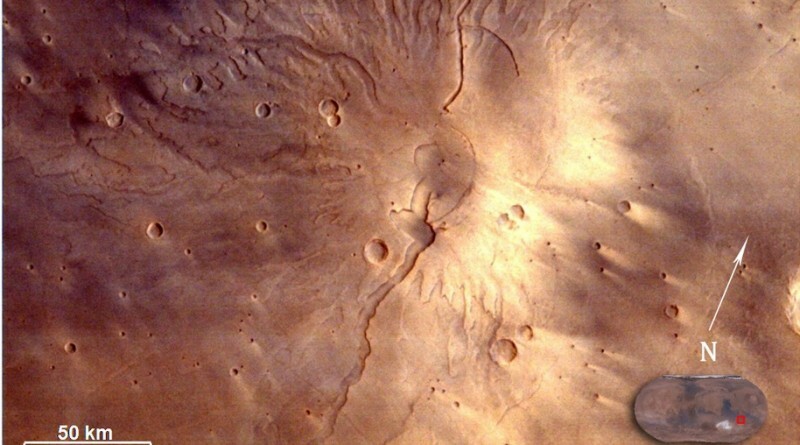 The image below shows Pital crater in Ophir Planum on the eastern reaches of Valles Mrineris. 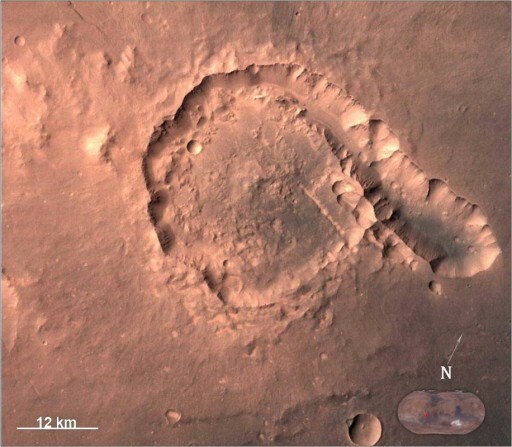 MOM took this image on April 23 when passing 808 Kilometers above the area for a ground resolution of 42 meters.